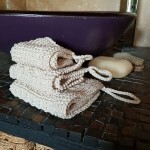 The yarn is pure, unbleached, undyed cotton and whilst cotton does sometimes get a bad press, this is the least processed version of cotton you can get hold of – so as eco as we can find and much better than all the wet wipes going to landfill. Our kit doesn&apos;t include knitting needles as most knitters have more than enough pairs, so we decided that adding a small cheap pair to the kit was just adding extra cost and potentially extra stuff you don&apos;t need. 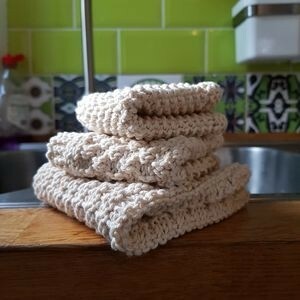 Use either 3.75mm or 4mm needles to make the cloths. 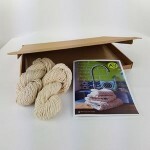 What you do get is 2 x 50g skeins of double knitting cotton, full instructions and an optional recycled gift bag, all packaged simply in a recycled cardboard box that will fit through your letterbox. There will be a small amount of tape holding the box together, but other than that the kit is free of polythene and plastic. Unfortunately multiple kits for the moment will need to include some plastic to not only keep kits separate, but to also send them securely, though we will keep plastic to a minimum. 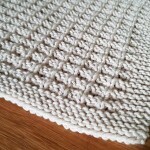 However, if you are a beginner you will have no trouble following the patterns as there is no shaping, but instead lots of combining of knit and purl stitches to create textures and patterns. 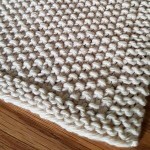 So great to practice stitches and also for more experienced knitters who want a fun, quick project. 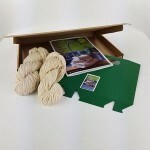 If you wish to give the kit as a gift you can choose from green, red or natural brown gift boxes but please note that this will be included flat in the box and will need constructing with either a little glue or double-sided tape. The yarn comes on two loosely wound skeins that will need twisting a little tighter to slot into the bag, but you must wind it from the skein onto a ball before commencing knitting to avoid tangles. If you fancy being creative you could always dye the skeins before you begin knitting, or dye the cloths upon completion. Cold water or procion dyes are the best for cotton or natural dyes will be perfect too. Please be aware that soaps and cleansing products could affect the long term colour of the cloths so check with the dye manufacturer for colour fastness etc. 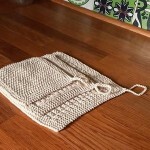 A great gift for yourself or a friend to create long-lasting, reusable item. This kit is constructed and delivered in plastic free packaging. Small – 14cm square, Medium – 17cm square, Large – 21cm square. Advanced Beginner. 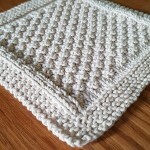 No shaping, but lots of combinations of stitches throughout. 3.75mm or 4mm knitting needles, crochet hook for loop, scissors and large eyed needle.